Maps at the bottom of the post. After breakfast we prepared for our first official adventure at Kenai Fjords Glacier Lodge: a half-day trip to Pedersen Glacier. We met our guide on the porch of the main lodge, where all of the gear is kept and guests are properly outfitted. An assortment of life vests hangs on one side of the porch, and rubber rain boots in various sizes stand in neat rows on shelves on the other side. There are bins holding dry bags and spray skirts for kayaking, and benches for people to sit, try on gear, and organize everything they need. 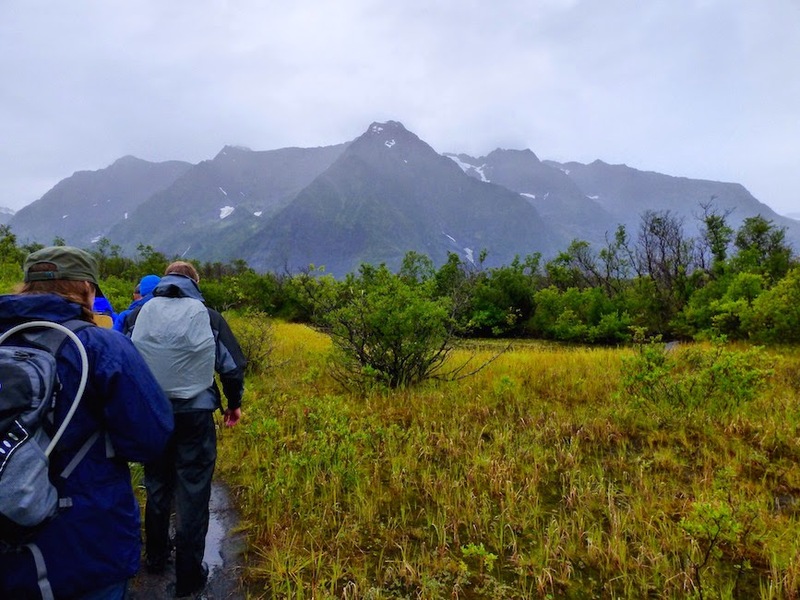 Once our small group was ready, wearing appropriately sized PFDs and rubber boots to protect against rain and mud, we walked around the side of the lodge and down to the shore of Pedersen Lagoon where a large canoe waited. Although not visible from the lodge, a second lagoon — Upper Pedersen Lagoon — sits directly in front of the glacier, and this was our destination. 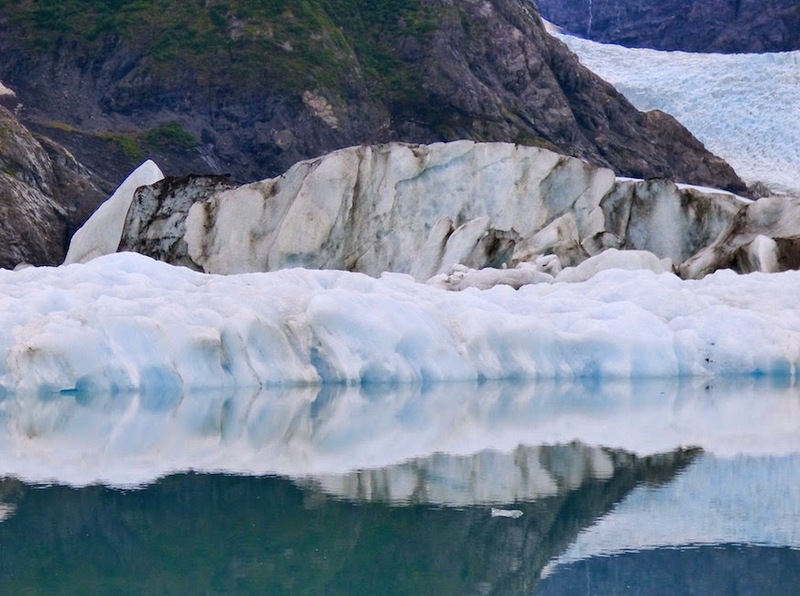 Pedersen Glacier descends from the Harding Icefield in the Kenai Mountains, and its terminus is on the upper lagoon’s opposite shore. We paddled across the lower lagoon, where the canoe was pulled ashore and secured with a rope so it wouldn’t float away when the tide came in. On the opposite side of the lagoon from the lodge, we were able to see how inconspicuous its presence is. The main lodge is barely visible if one knew where to look, and I could see no trace of the small guest cabins. We set off on a path toward the upper lagoon, with frequent pauses to learn about various plants growing along the route (and sample various berries), observe signs of animal presence (like a tree heavily scratched by black bears), and contemplate the different landscape features (such as kettle ponds formed long ago by huge chunks of glacial ice). The walk to the upper lagoon was short - maybe a mile and a half - and we soon found ourselves at its shore. Calved ice from the glacier, from small chunks to large icebergs, floated in the water, and we could feel cold emanating from Pedersen Glacier itself. The mountains around us were lush and green, and misty clouds floated among them like smoke. It was one of the coolest places I’d ever seen. After spending almost an hour at the glacier, it was time to return to the lodge for lunch. As we paddled back across the lower lagoon, we aroused the curiosity of a few sea otters. They seemed to find us as fascinating as we found them, and they swam close to our canoe, bobbing around in the water and craning their necks to get a good look at us. Everyone was thrilled, including our guide. It was impossible not to fall in love with these wonderful animals. Sea otters in Pedersen Lagoon. Photo by Andrea. After lunch we returned to the porch to get ready for our second adventure: an afternoon trip to Addison Lake. Addison Lake is a small lake accessed by canoeing to the north side of the lagoon, then walking a mile or so along a path over a ridge. Another, smaller canoe waited for us near the shore of the lake, and our small group of six piled in for a leisurely paddle. Addison Lake was a draw for both people and animals at this time because salmon were spawning in its shallow water. This attracted bears and eagles that fed on the salmon, and in turn afforded us the potential to see a variety of wildlife. The lake was dead quiet except for the occasional splash of salmon, seen in clusters near shore all around the lake. 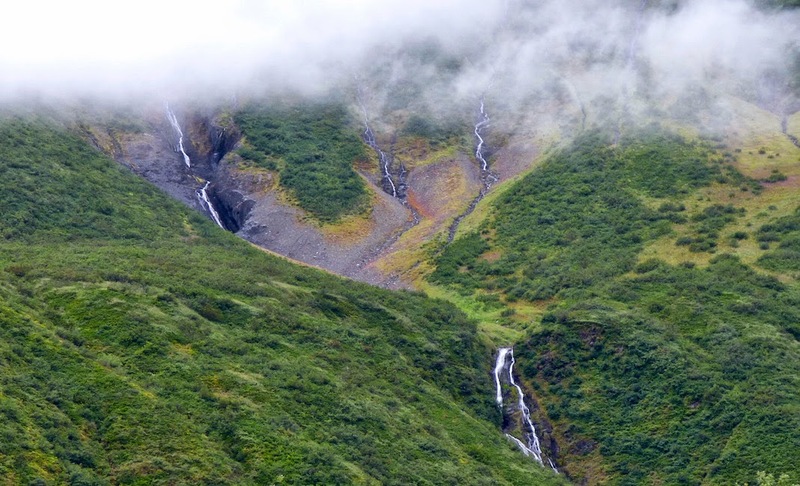 Mountains rose up all around us, some streaked with streams of water from melting snow and ice at their peaks. A small female black bear emerged from the brush to walk the shore, seemingly searching for an easy catch. She looked as though she had recently given birth, but catching a meal must not have been crucial for her at the time, as she did not stay long. This was the first bear sighting of our trip, and everyone fell silent as we floated in our canoe and watched her look around then disappear back into the brush. Despite the onset of more rain, we continued slowly paddling around the lake, enjoying the beautiful views and observing salmon and harbor seals, which find their way to Addison Lake via a stream that connects it to Pedersen Lagoon. When the tide comes in, the seals can swim up into the lake, but when the tide goes back out, they are temporarily stranded there until the next high tide. They toyed with us, poking their heads out of the water, then disappearing and re-appearing somewhere else as soon as photography was attempted. No one said anything at the time, but we had a conversation later with some other guests that proved we were all thinking the same thing: seals are terrifying. Sometimes they appear cute and harmless, popping up playfully to delight us with friendly faces. Other times they are specters of death, emerging from the depths to remind us that life is temporary and this could end at any moment, our corpses returning to the sea from whence we came. They are there, waiting to guide us on that journey. Keep it up! The photos are unreal (in a beautiful way, but occasionally in an extremely creepy, I'm-staring-into-your-soul kind of way).